Review posted September 5, 2012. Houghton Mifflin Books for Children, 2011. 36 pages. This is a gentle and soothing picture book that rewards reading and examining again and again. The text is unrhymed poetry, with only a few lines on a page, and very large print. You could read this book to very young children with a short attention span, but it will also work with older children, who can notice new details on each page. The beautiful pictures were created by Beth Krommes, Caldecott medalist for The House in the Night. She uses the same scratchboard technique here, with more colors. The technique works well for showing spirals, since the lines are distinct and clear. A spiral is a snuggling shape. It fits neatly in small places. Coiled tight, warm and safe, it waits . . .
We've got a snow scene, but most of the picture is taken up with what's underground. We see several animals curled up in their nests for the winter, and small print labels them: a bull snake, harvest mouse, eastern chipmunk, and woodchuck. All the animals are resting in a coiled shape. The next page shows those same animals emerging into a springtime landscape, but the sharp reader will still spot some spirals. 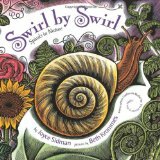 The book goes on, gently and soothingly, showing seashells, ferns, ram's horns, coiled tails and trunks, spiderwebs, and even gets much bigger in waves, whirlpools, and tornadoes. The climax takes us all the way out to galaxies, and then back to the cozy winter landscape again. There are even two pages at the back that give some of the science (and math!) behind spirals. This was one of the books we discussed at the Bill Morris Seminar in January, and my fellow attendees made me appreciate it all the more. It's the sort of book into which you can delve much deeper than initially meets the eye, a book you and your children will want to look at and read again and again.